At the IBC2018 exhibition, taking place September 14-18 in Amsterdam, Magewell's theme will be showcasing how its latest innovations extend its product lines “beyond capture” into other critical signal processing functionality. Magewell will exhibit in stand 8.A84. 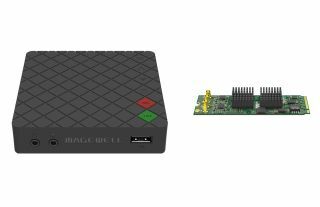 Spearheading this expansion will be the European debut of Magewell’s new Ultra Stream HDMI standalone streaming encoder. Designed to make live streaming simpler, even for non-professional users, Ultra Stream HDMI lets them record or stream high-quality video with one click using on-device buttons or an intuitive smartphone app. Users can stream to popular services including YouTube, Facebook Live, or Twitch, or to a custom-specified server, and can record video as files to a directly connected USB drive or the associated smartphone. The device encodes video up to 1080p60 from an HDMI input and also supports 4K sources, down-converting them automatically to HD. Flex I/O: Flex I/O PCIe input-output cards combine Magewell’s video capture technology with versatile playout capabilities. Available with SDI or HDMI interfaces, the first two Flex I/O models each feature four input channels and two outputs, all of which can be used simultaneously with independent resolution, frame rate, and processing settings for maximum flexibility. Eco Capture (M.2): Designed for use in small and embedded systems where full-sized PCIe slots are unavailable, the Eco Capture family of video capture hardware offers OEMs and systems integrators an ultra-compact capture solution with low power consumption. Featuring an M.2 connector and measuring 22x80mm, four Eco Capture models offer single-channel 4K (HDMI), dual-channel HD (HDMI or SDI), or quad-channel HD-SDI capture. Pro Capture: New models and enhancements in Magewell’s flagship Pro Capture family of PCIe capture cards will make their IBC debuts, including a multichannel CVBS model for ingesting legacy analog signals, an additional dual-channel 4K Ultra HD configuration, and recently added HDR support in select configurations. USB Capture Plus: Magewell’s plug-and-play, external USB Capture Plus devices bring SDI, HDMI, or DVI sources into popular software, enabling all types of computers including laptops to capture HD or 4K signals through a standard USB 3.0 interface.